A new poll reveals Washington D.C. Mayor Adrian Fenty is trailing his Democratic opponent by seven points. 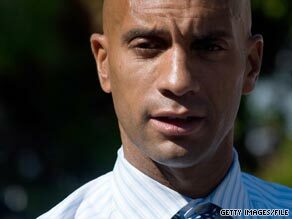 Washington (CNN) - With six days to go until a crucial mayoral primary in the District of Columbia, a new survey suggests Mayor Adrian Fenty is fighting for his political life. A Clarus Poll released Wednesday evening indicates that challenger and D.C. City Council Chairman Vincent Gray leads Fenty 45 to 38 percent among likely Democratic primary voters, with 14 percent undecided. Gray's seven point advantage is within the poll's sampling error. Since Democrats dominate elections in the city, the winner of the September 14 Democratic primary will be considered the overwhelming favorite in the November general election. The Clarus poll follows by eight days a Washington Post survey that indicated Gray held a 13 point advantage over Fenty among registered Democratic voters and held a 17 point margin among those likely to vote in the Democratic contest. According to the Clarus poll, Gray, who jumped into the race in late March, leads Fenty by a 62 to 17 percent margin among African American voters, with Fenty holding a 68 to 22 percent advantage among white voters. Fifty-five percent of the survey's sample was African American and 38 percent was white. The Washington Post poll also indicated a large racial divide. Early voting began August 31 in the District of Columbia, and runs through Monday, the day before the primary. "Vincent Gray has expanded his lead over Adrian Fenty since mid-August," says Clarus President Ron Faucheux. "But Election Day turnout is still the key factor–and the best remaining hope for the mayor's re-election campaign." On Wednesday, Fenty, who was first elected mayor in 2006, told WTOP, the city's all news radio station, that he personally called the White House to ask for President Barack Obama and first lady Michelle Obama's endorsement. Fenty endorsed then presidential candidate Obama prior to the 2008 D.C. primary. "I have personally reached out," Fenty told WTOP. "I don't want to get into who I would have talked to for obvious reasons." Fenty said he does not expect the president to make a personal appearance on his behalf before the primary. CNN reached out to the White House regarding Fenty's request. The White House declined to comment. The Clarus Poll was conducted September 7, with 492 likely Democratic primary voters in the District of Columbia questioned by telephone. The survey's overall sampling error is plus or minus 4.4 percentage points. Don't give Republicans a free ride for another 8 years. Don't believe polls this much in advance. Lot of people are on the fence and may and will change their votes.